Black Vanilla the metro-mod, lounge café located at 197 South Street, Newburgh, N.Y., serves a bespoke blend of coffee (which they also sell) and offers an always-changing menu of tasty breakfast and lunch options. This is a different part of Newburgh, one that doesn’t always get the same fanfare and press The Liberty Street Historic District area does, but we have a confession to make: we like the beauty of this part of town. It’s hillside location gives it a sweeping drama, and it’s not far from Downing Park and Mt. St. Mary College, putting it near two important city landmarks. We visited our new friends there, and when we entered the shop a sign greeted us that read, “Great food is not fast and fast food is not great,” Indeed! This slow food philosophy permeates the establishment, and regulars appear to like the leisurely pace that fosters conversation and community. Folks line up for their coffee of choice, whether latte, cappucino, espresso or hot tea. A kindly woman takes orders and, often, it is Jerrod, part of the husband and wife team that owns the place, who is serving up delicious looking croissant sandwiches or pastries and parfaits. Patrons politely stand on line chatting and smiling, or, sometimes, singing! as they wait. This sharp looking café is the brainchild of the aforementioned husband and wife team, Melanie Collins and Jerrod Lang. Melanie, a corporate flight attendant, hails from Albany, N.Y., where her dad once owned a restaurant, and Jerrod is a Newburgh native who grew up not far from the newly opened café. 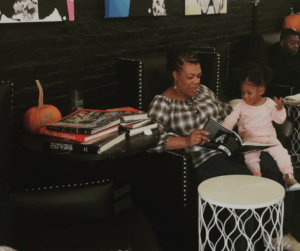 Melanie credits her late dad with the customer service ethic that shines at Black Vanilla: the minute you walk through the door, you know who the proprietress is, because she greets you with a big, warm welcoming smile to let you know you should feel right at home, and you do! It’s like being welcomed into the loving arms of old friends and neighbors. “That’s the lesson I learned from my dad: make everyone feel welcome!” Melanie recalls. Who could resist her? She is as pretty as she is sweet and has a certain down to earth quality, while also exuding a dreamy quality. Jerrod cites a military career, which took him overseas, as spurring him to come back to his old neighborhood. It’s a neighborhood he wants to see make its way back to a time when every manner of shop, from butcher to dry cleaner, to clothing retailers could be found in every corner of the city. Now, most of that kind of commercial real estate retail activity is located on Broadway and the newly resurgent Liberty Street, but Jerrod has different plans for this north-western section of Newburgh. He sees no reason why the renaissance on Liberty Street should be confined to just that section of Newburgh. “My family is from Newburgh, I was born and bred here, I am from this corner right here. Actually, I grew up on Johnson Street!”Jerrod recounts. “I’d like to see more businesses and pizza shops, more small mom and pop shops. I’d like to come into Newburgh and there would be one-stop shops. I could go shopping, get my hair cut. I could keep my money in Newburgh. That’s big!” he explained. 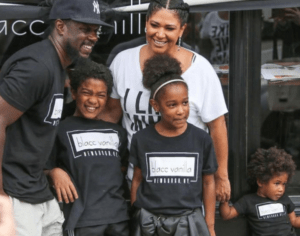 For now, Melanie and Jerrod have plans to bring music and fine dining, and evening events to Black Vanilla. They have expanded their hours and are open every day from 7:00 a.m. to 5:00 p.m., except Monday, offering live music on Sundays from 12:00 to 3:00 p.m. They don’t relax about contributing and being a part of Newburgh’s community effort scene, either. When queried, Melanie admits: “We contributed to having Victoria Harriot, who does all the artwork in here (their cafe), do a portrait of Judy Kennedy, our Mayor. 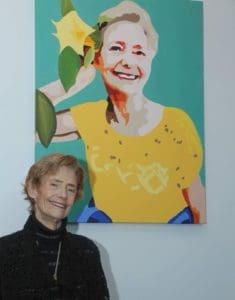 The goal is to have the portraits of Judy displayed on the walls of a lot of the different buildings around Newburgh on a rotating basis.” she said. Newburgh Illuminated brainstormed the idea, (the work was also commissioned by Richard Fracasse and Dave DeLeo) and they presented the portrait to the Mayor this January. To see Victoria’s work, visit Grit Works on Broadway. Beloved Mayor Judy Kennedy stands before a picture of her commissioned by Blacc Vanilla and other supporters of Newburgh Illuminated, the community group behind an annual event promoting the city of Newburgh, N.Y.
As we move through the seasons, it’s comforting to know about this new place. The cafe instantly seems a timeless, permanent fixture. It reassures that delicious coffee, tea, and morsels are just inside, drawing old friends and new. When you visit (and you have too!) take a moment to stand outside of Blacc Vanilla. Glance down South Street. Your eye will encounter one magnificent architectural gem after another, and in the distance a skyline of ever more neighborhoods. You’ll get a good sense of the expanse of this small city. Equally engaging neighborhoods dot the landscape, and they beg exploration. So, do come! And make some of your own discoveries as well as some new friends. 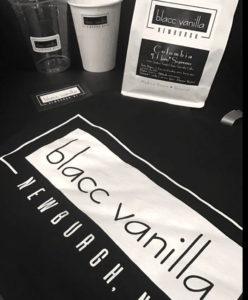 For more information: go to Blacc Vanilla’s website, or Facebook page, and you may also find them on Instagram!